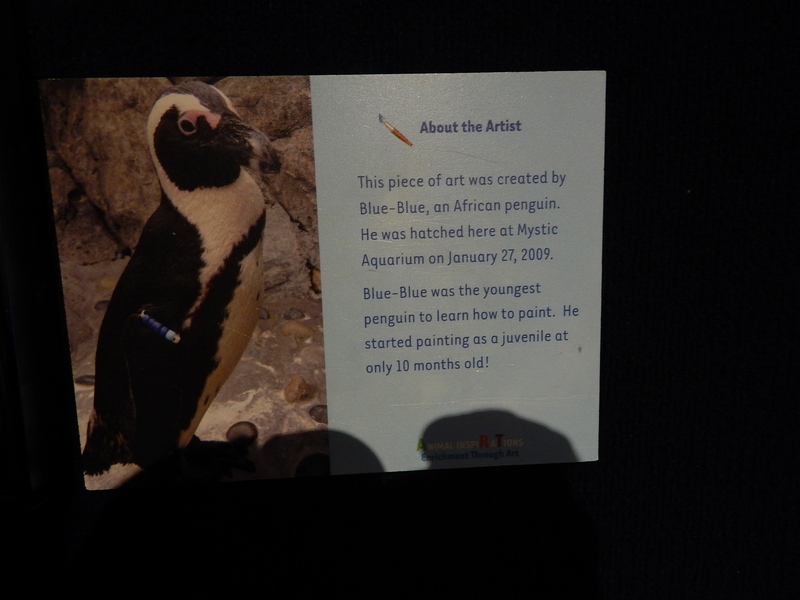 Last spring, we went to the Mystic Aquarium in Connecticut, United States. We don't like places with captive animals, unless they're work is essential for the survival of life on the planet. We may visit some that are caring for rescued or injured animals until they can go back to the wild; and some that are providing life-long loving care for animals who can never be released. The facilities must be governed by organizations with strict rules. They must have a global conservation and education mission. 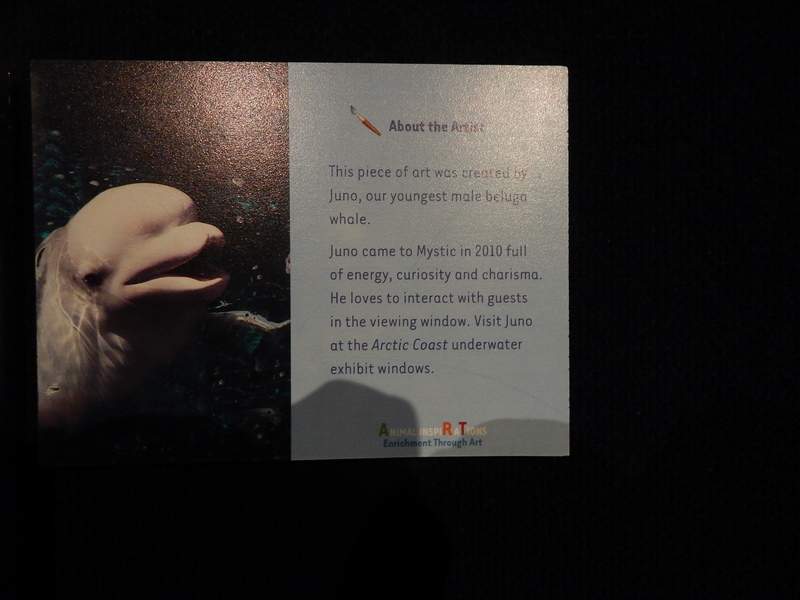 The Aquarium seemed to meet our criteria, until we came to an exhibit that disturbed us. They were selling "paintings" by animals, each with a profile of the "artist." 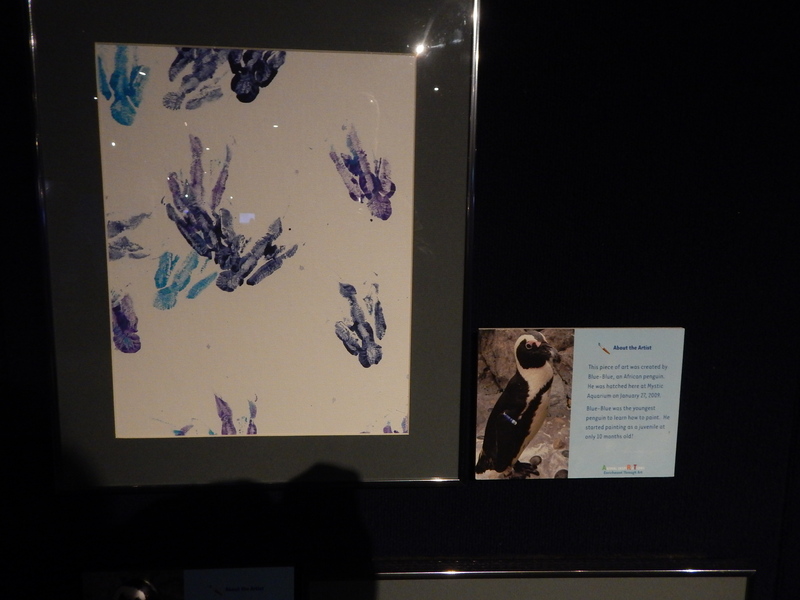 The penguin made multiple colored footprints. 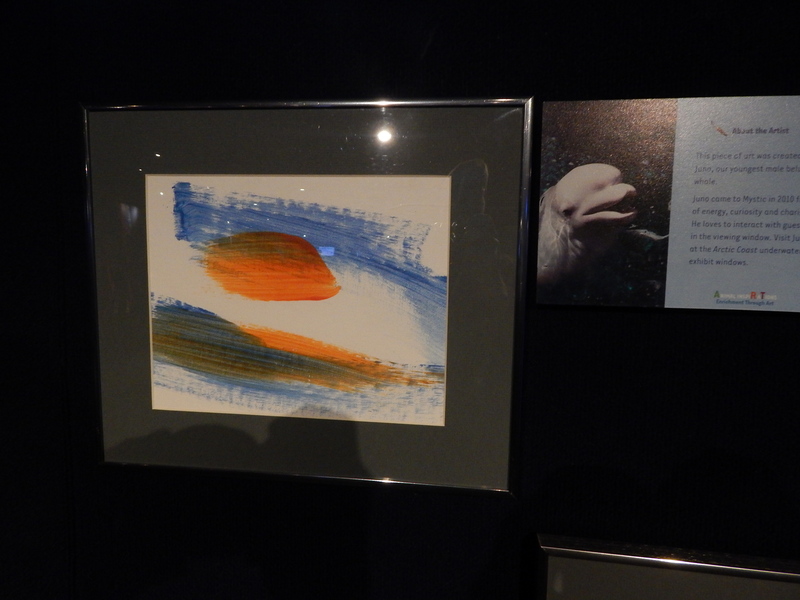 A beluga whale made one with long brushstrokes. Apparently they hold the paintbrush in their mouth, but I'm not sure of the procedure. We worry that the paint is toxic in the long run, even if doesn't seem to be at the moment. We worry that the whole activity is unnatural to the animal, might be frightening or otherwise disruptive, especially if they go back to the wild. Penguins do walk in their natural habitat, but they don't use paint and are not forced to walk on a piece of paper. I doubt whales do anything remotely related to putting a brush in their mouths and creating "art" in the ocean! We had an uneasy feeling that the animals were just being used as entertainment without enough attention paid to their care. We expressed our concern about the the painting activity to an employee, who told us that creating this "art" is not only safe, but actually beneficial to the animals. Is that a proven fact? If so, what are the benefits? Are there also dangers such as those I mentioned, or others? This question does not appear to be about outdoor activities within the scope defined in the help center. There are certainly folks who would say that the entire idea of keeping marine animals in captivity and on exhibit is bad for the animals. However, if you are willing to accept keeping them in captivity, then providing them with enrichment activities is probably good for their mental health. Admittedly, painting is not a natural activity, but it probably beats swimming laps around a concrete tank 16 hours a day. Not the answer you're looking for? Browse other questions tagged animals animal-behaviour conservation or ask your own question. Is playing musical instruments like Harp/Harmonica, Flute unsafe during backpacking trips? Could I have a postmortem on this suburban raccoon encounter? What wild animals are there in California that can be dangerous or create hassles, and how do I avoid problems with them? Is Germany or any of Europe really rabies free?